Special assistance is provided by the United for people who are disable, for children who are traveling alone, pregnant women and even for animals. Disabled: Generally, the disabled are required to provide information about their disability (as much as possible) at least 48 hours before travel. At the same time, it is also important to come for check in at least 1 hour in advance of published check in time. For the mobility disabled, there are sufficient number of wheelchairs at the airport. Wheelchairs are also provided inside the cabin in the form of aisle wheelchairs. However, United has these wheelchairs on all those aircrafts which have more than 60 seats and can be used to access the lavatory. United also makes it a point to make boarding possible for the mobility disabled. Whether by way of the Passenger Assist Lift, ramp or stair chair. E-cart services are also provided to people for their distant transportation needs. For the people who want to take their own wheelchairs on the airplane, the manual wheelchairs can be checked in or kept in stowaway in cargo area. People can, however, make use of the wheelchairs provided by United. For the battery powered wheelchairs, there are a number of restrictions and limitation to ensure safety of passengers and the airplane. Spillable batteries are required to be free from all defects, should be disconnected and, if disconnected, it shall be packed upright and tightly to ensure that there is no leakage. Non-spillable batteries may not need to be removed if there is at least one means inbuilt to prevent accidental short circuit. For the Lithium Ion batteries, there is a requirement to follow the Federal guidelines which allow for carrying one large such battery installed in device and two more batteries, each not exceeding 300 watt hours. The spare batteries of less than 100 watt hours shall be carried only in the cabin of the airplane with suitable safety measures to prevent against the inadvertent short circuiting or other damages. b. Severe hearing and visual impairment to an extent that he or she is not able to understand safety related instructions or is not able to exit in case of emergency. c. Severe immobility which prevents him or her from emergency evacuation. d. Need stretcher and personal incubator. a. Travel for them is permissible only on flights operated by United Airlines or United Express. b. 5-11 years of children must make use of the Unaccompanied Minor Service. Unaccompanied Minors have to pay the full adult fare and are also required to pay an additional service charge of USD 150 each way for each such UNM. Infants: Any infant less than 7 days of age is not allowed to travel on United. Only one child under the age of 2 can be carried in lap of an adult of at least 18 years of age including parent or guardian. This rule is applicable only in case of flights within USA, Puerto Rico and Virgin Islands and there is no need for buying a ticket as well. For other destinations, there is a requirement to buy the ticket even for 1 infant under 2 years of age. If the child is not able to sit upright, there is a need for having proper car seat for the child. These seats shall be of required quality as mandated by FAA. Pregnant Women: A pregnant women will be allowed to travel without the need for any certificate for the first eight months of her pregnancy. However, for women in ninth month of her pregnancy, there is a need for three copies of certificate issued by obstetrician- one original and two photocopies. This certificate must have been issued not later than 3 days from the scheduled departure of flight. 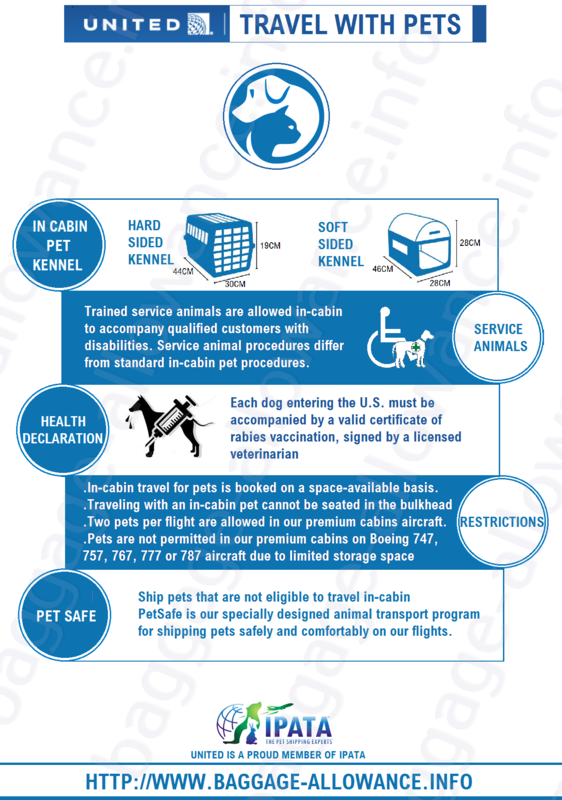 Pets and service animals: United allows dogs, cats, rabbits and birds to be carried in the cabin of flights within USA. This does not form part of the free baggage allowance and a service charge of USD 125 is levied on it for each way travel. If there is a stopover between the connecting flights and this happens to be more than 4 hours in case of flights within USA and of more than 24 hours on international flights, then an additional USD 125 is levied. The maximum dimensions of the hard sided kernel is 44, 30 and 19 cms and for the soft sided kernel is 46, 28 and 28 cms. Another requirement is that the animal shall be able to stand up and turn around comfortably. You are allowed to carry only 1 pet in one flight of United Global First, United First, United Business and United Businessfirst. However, even within these flights, pets are not allowed on Boeing 787, 777, 767,757 and 747 aircraft due to limited underneath space of seat. In UnitedEconomy, 4 pets per flight are allowed. Service animals are allowed to accompany the passenger in the cabin if the nature of the disability of the passenger is such that it warrants travel of pet along with passenger. However, it shall be properly trained, restrained, muzzled and seated in front of the passenger seat without protruding to the aisle area. Alternatively, you can make use of the PetSafe service of United which is for those animals who are not allowed to travel in the cabin. My mother is planning to travel from Richmond Virginia to Flint Michigan. There is a layover in Chicago. Could I make arrangements for the airline to transport her from Security in Richmond to her gate and to her gate in Chicago layover? If so, how would I do this? She does not necessarily need a wheel chair, an electric cart would work but if not available she is willing to be transported in a wheel chair. You need to inform the airline at least 48 hours before the flight time for the wheelchair assitance. It provides wheelchairs at airports, in aisles and e-carting services. Its personnel would also help in accessible boarding.